If people are not in the job, people will only see Van Don wild and poor, only the sea is not very beautiful, many forests and sparsely populated areas, the town center as well as Cai Rong port area which is so quiet in low season. But with the real estate market, few people know that many good brokers have made billions of money every day and alternately become sick, even hospitalized for receiving their guests and trading on peak occasions. 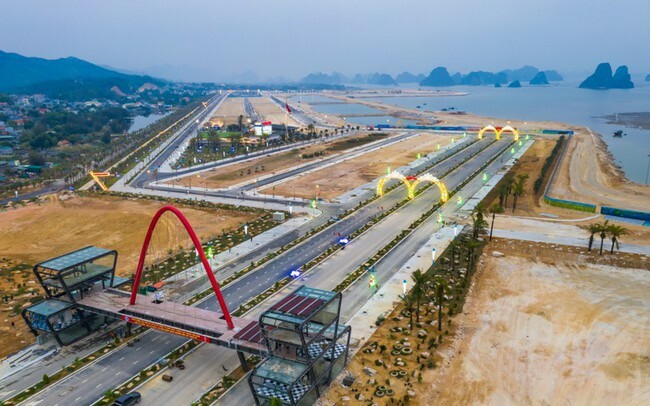 A month ago, the Quang Ninh provincial government officially issued a document on the settlement of administrative procedures on land in the area, allowing land transaction for those who meet the following conditions and provisions of the Law on Real Estate Business. The "opening order" immediately made Van Don real estate market like a 7-month pent-up spring, which was turned up exciting. After Tet, walking the early spring days to "hot land of Van Don", if it is a pagan, it will not feel anything but the land and rocks, the forest and the unspoiled sea are not attractive, if you listen to real estate also know where to find transactions, what areas of rumors and real estate investors are busy buying and selling investment. During the peak days, the three most popular brokers Van Don took turns sick due to exhaustion to be hospitalized, because every day the broker only slept for 2 hours. Carefree disclosure with reporters and a broker leader said the number they could earn was up to 1 billion VND / day. However, not all brokers who come to Van Don are lucky. The number of tourists is investors and brokers from places pouring here, many provinces and cities across the country including Ho Chi Minh City or Phu Quoc. In fact, many investors and brokers walked many times but still came back empty handed. According to Mr. Nguyen Manh Phong - Vandon Star Real Estate Trading Floor owner, a well-known indigenous trading floor in Van Don specialized in Phuong Dong project and knowledgeable planning in the island district said: The owner of the trading floor can do business In Van Don at the time of near and after Tet, people have laid thorns and tasted honey in Van Don for a year or two. Whether the floor is from another place or the indigenous floor, they know every part of this land like the palm of their hand. They have information about investors, location of projects, hunting information on planning policies, specifying opportunities according to infrastructure progress and calculating customers' opportunities. They are quick-witted and most of them are the ones who have the money to hold good goods to sell to investors at a reasonable price difference ... It's a long process, the reason they can make money One day, not one minute of sewing. Van Don Real Estate Broker has also formed its own community and culture with clear personal patterns and imprints. Each broker, floor owner is the one who focuses on investing in personal brand, floor brand and spacious and modern facilities. “I had a trading floor in Van Don town center, but to serve customers interested in Phuong Dong project - The project is making waves by the speedy progress on infrastructure and issuing red books, I built build a modern and open transaction area right at the most favorable position of the project to serve the best customers ”- Mr. Phong shared. Another interesting character is Mr. Pham Quang Tung - Brand owner of Thanh Tung electronics supermarket chain and Thanh Tung Van Don real estate trading floor. The model of this floor is 4 in 1, meaning 4 works in the same space. The space is designed as a coffee shop so that customers can sit comfortably, receive advice, or exchange goods, connect new partners and more active networks. Done every transaction, this space can also organize parties and arts with famous singers ... When going out whether to buy goods or not, every guest on the floor will receive warm gifts. respectfully in a very friendly way, Mr. Tung considers it a respectful gesture and a good impression of Van Don for his guests to come back. Characteristics of real estate brokerage is highly competitive, but in Van Don, the brokerage community is cooperative and cross-support is quite harmonious. In the future, this place continues to be a hot spot for real estate when macro-economic policies are best implemented in emerging markets. Shark investors start up, a team of young, dynamic brokers who keep up with the trend of the trend will contribute to creating credibility and confidence with buyers of this potential area.